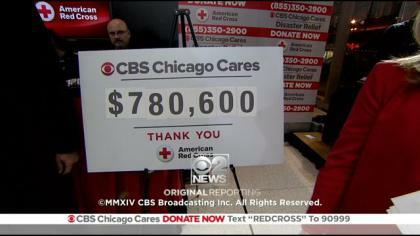 CBS Chicago Raises Almost $800,000 for Red Cross | Broadcast Public Service: Local Stations. Big Impact. CBS Chicago‘s local television, radio and digital media platforms, including WBBM-AM and WMVP-AM, raised nearly $800,000 during their third annual Day of Giving on Nov. 25. For 13 hours, CBS hosted a live telethon/radiothon to raise money for the American Red Cross of Greater Chicago’s home fire relief efforts. Each year, the Red Cross provides food, shelter and comfort to 1,400 local families whose homes are damaged or destroyed by fires. CBS and the Red Cross also distributed free smoke alarms.